ok, im intrigued. i love sailing, though its years since ive done it, and i quite fancy having a go at sailing in a canoe. but its always been something on the periphery of this site, till now. ive scoured through here and read a lot of stuff, but i dont know what i need or should have or where to start. 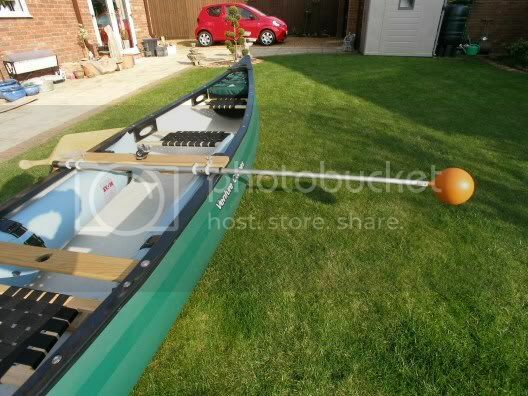 i should say that ive got a spare canoe sat on the rack. the kids have no interest in it so i figure it may make a handy victim for a sail conversion. its a 15 foot grumman ally canoe, but where do i start, sourcing stuff to make a mast or a sail, do i need bouyancy or outriggers, obviously a centreboard is out, but what do you guys reccomend, rudder? general fittings etc. is there a guide where i can look through the steps i may want to follow. has anyone built a grumman into a sailing canoe, or is it a daft idea? whilst the sailing bit seems great fun, im wondering where to start with everything else? Last edited by johnr; 25th-August-2012 at 09:36 PM. Grumman canoes are widely viewed as outdated relics by many in the marketing world. To me, this is ridiculous on its face. I have never in my life seen a bad Grumman product. There are certainly more modern designs, made from more advanced materials, but many differences are mostly a matter of a few degrees. Most canoes differ little in function under the control of the average user. Use your Grumman with confidence. Grumman manufactures a Lateen sail kit that you should Google. It is a small sail of 44ft and will be a good candidate for a 15ft canoe. I have two large Grumman gunter rigs for an 18ft canoe that I recently sold - for more than I paid for it. I regret doing that. Currently, my outriggers and the grumman sail are mounted to an old royalex canoe made by Easy Rider here locally. It is 17ft and lighter than the average royalex boat in that length. I would rather have my ancient 18 Grumman back. The Lateen kit includes leeboards, a rudder kit, a mast partner and step. here's where you might have a proble: The 15ft Grumman is not a sailing model so you might not have the floor attachment points for the mast, or the gunnel points for the partner. The great thing about Grummans is that it doesn't matter. The thing is aluminum and can be drilled, bolted, cut - you name it, you can modify it. Last edited by OutnBacker; 26th-August-2012 at 03:58 AM. cheers john, im googling as i write this! i do fancy making stuff myself though, just to see if i can. and i agree about the grumman, its a lovely thing, i dont care what other folk think of them, in fact, the majority of folk who slag em are usually repeating the comments of others having never been in one. sure theyre old tech, but given the choice between a modern range rover or an old series land rover, if you had to take a trip into the wilds and look after everything yourself, i know what i would choose. old tech is almost always built to be used forever! any other folk want to offer their own experience or tips? I really enjoyed making all the parts for it including the balanced lugsail and rigging , the trouble was it didn't sail very well into the wind using a polytarp sail and when I looked at the cost of the materials it really amounted to the same as if I had purchased the better built and proven items Solway Dory can supply.I am now in the process of replacing all the home built parts with Solway dory ones except, ironically enough the leeboard thwart which I intend to do away with by creating a fiberglass rib inside the hull of the canoe to which I can bolt the leeboard and free up passanger space in the middle of the boat. Notice in my response that I never used the word "lovely" to describe a Grumman canoe, unless you are referring to the beauty of solid construction and function I also appreciate the use and re-use of older equipment, especially since it is often had for pennies-on-the-dollar. I got some inspiration for creating a nice sail for myself watching this chaps collection of videos on youtube. Pretty good stuff for sail cutting and sewing. Few canoes sail upwind very well. The regular, off-the-shelf canoe isn't designed to sail and thus, they have some weaknesses in performance. But, they are alot of fun. There are ways to improve the up wind work. Good placement of the lee boards is critical, as well as placement of the mast, especially with a flat bottom design such as the Grumman, which tends to skitter sideways when going to weather a bit more than a rounder bottomed boat. The no rocker keel line is also a problem when tacking, along with the usual issues of a long, skinny hull trying to turn. It just makes the the movement more sluggish and you lose way quickly. Deeper leeboards also help with a better bite on the water. Canoes are very much like small Viking ships, Greek biremes, and Turkish gallies - none of which turned very well, but were also likely alot of fun - if you were on the winning side. Last edited by OutnBacker; 26th-August-2012 at 01:54 PM. The main hinderance to my Grumman going upwind I think was the poorly cut polytarp balanced lug, it would sail upwind just about on the tack where the sail was off the mast but on the other tack it was hopeless.My solway Dory Curlew sails upwind very well , this is due to the properly designed,cut and made 44 sq foot Bermudan sail.I intend to put this sail onto the Grumman and get a slightly larger sail for my Curlew. I found my Grumman would tack very well, it is the type without a keel, although I haven't sailed for some years it since I got my Curlew so it will be interesting to compare it. You have a shoe keel model? Nice. I know of only one I've ever seen. I'm going to assume that you had a good leeb'd-to-CE placement on the canoe, as well as having the advantage of the smoother keel. Otherwise, it can take a fleet of tugboats to bring a Grumman about unless you have good way on going into the tack. I also found that if the dinghy order of "hard a-lee!" is executed, the hard over rudder can almost stall the canoe as the wind hits the fore quarter. So, I ease the rudder into the tack and have had good success that way. Another tactic I use is pivoting the lee'bd forward til the tip is below the mast. I got mine to work well enough after a bit of fussing about. Anyway, I still miss the Ol' Battleship. A Note on that standard keel found on almost all Grummans: If anyone thinks that getting a portable bandsaw and cutting off the flange is a good idea - Stop! If the flange goes away, so does any stiffness in the hull. The shoe keel models are made with a matching keelson on the inside of the hull to add ridgidity since the outer flange is not there. I have just finished my canoe sail yesterday. This is & never was intended to be anything other than a bits n bobs affair on a budget useing household materials. Keeping tongue firmly in cheek I will blog shortly with photoes. The sail idea is purely to gently bibble me along with a gentle breeze. It had to meet one criterea though, that is that it can be raised & lowered without me leaving my seat, that bit works a treat, in the polytunnel, however, it has yet to be trialed with the wet stuff. Hi John - glad to hear you're intrigued by sailing canoes. I've only just caught up with this thread - I'm a wet and windy campsite near the Kyles of Bute! I've sailed a Grumman - it was the first canoe I ever sailed, about 30 years ago. It had a Grumman lateen rig and rudder but no proper leeboard, so I improvised quite successfully. But it was a borrowed boat so then I rigged my own plastic one. There's more to the story and lots more that should be useful besides, on the website linked in my signature below. The other bits of good news are that you are close to many of the more active canoe-sailors in the UK and one of the OCSG members actually lives in Freckleton, too. I could drop him an email to see if could have a chat and maybe show you his canoe. Another good option would be to get along to one of our meets to see how others have set their boats up. The next meet reasonably close to you is at Coniston at the end of October. You would be very welcome to come and see and even have a trip out on the water in one or two of members canoes if you like. Old Grummans used the early type of styrofoam floatation in the bow and stern chambers. U.S. Coast Guard regulations stipulated that it must be enough to float the boat with you hanging on to the outside. At the time of those regs, styrofoam was fine, but with age it absorbs atmospheric moisture and can become less bouyant. There are alot of older Grummans at the bottom of lakes and ponds because of this. Do not rely on the floatation chambers that are built-in if you have an old boat. Also, end chambers alone can make it additioanlly difficult and exhausting to re-enter a swamped canoe because while they may float the boat, they will also cause it to roll every time you try to get in. Floatation along the sides is good, especially while you learn. I'm pretty sure, but not positive, that newer Grummans, and other better quality aluminum boats in general, use Ethafoam, a closed cell product that does not absorb moisture. hi keith. that sounds interesting. by all means pass on my details if you think theres someone near me with something i can look at. i will pencil the end of oct in and see if i can get up to coniston for it. thanks for that reply. I did some sailing earlier this year alongside a Grumman. See the fist few minutes of my rather long video! Before you start bolting anything to your canoe, you really need to decide what sailing rig you intend to use and from this you can work out where the centre of pressure is. (Central force of that sail) Basically your leeboard wants to go in the middle of your canoe (Front to back) and this is usually the widest part of the canoe. Then your mast needs to be forward of the leeboard so that the centre of pressure roughly in line with the leeboard. As long as your leeboard can pivot forward and backward down the side of your canoe, you can then trim your canoe so that it is balanced. Effectively if you move your leeboard forward and backward, the result will be that your canoe will gentle turn away from the wind or into it. Normally we like our canoes to turn gently into wind, but I have sometimes found it neccesary to trim my canoe to turn away from the wind when I am paddle sailing and paddling on the windward side and I want the canoe to turn back downwind slightly between paddle strokes. Despite what may have already been said, Solway Dory do an excellent pivoting leeboard and despite the price tag, it is a work of art and worth every penny and then some. To get started, you just need a sailing rig and a leeboard. My Expedition rig (Again Solway Dory) and quality leeboard enables me to tack into wind nearly as well as my Enterprise sailing dinghy and if the winds are light'ish, using paddle strokes as well, I believe I can point into wind even better. Rudders and outriggers can come later I feel, but extra buoyancy by means of side airbags are more important if you plan to sail more than 50-meters from shore (Or as far as you can comfortably swim) as you need to be able to get back into your canoe if it rolls over and at the very least, hang onto it until help arrives! I developed a telescopic arm/ float device to help me get back in. I am a "recover from a capsize" kind of sailor more than a "prevent a capsize from happening" kind of sailor in using outriggers etc. Not to say that outriggers are a bad thing, just that I don't feel I need them for my type of sailing. Canoe sailing is an interesting hobby and canoe sailors tend to be nice people, so go ahead, dig the Grumman out of the garage and have some fun with it. ok, ive browsed the canoe sailing clubs site, and ive looked at whats available from solway dory (sp) ive looked through youtube, and im still up for a sailing canoe. im off next weekend for a fortnights break doing a bit of quiet camping and canoeing in cambs, and when im back i will be going to look at a setup tha the guy from brookbanks in lancaster has. and then i'll be getting a good look at anything else anyone will show me before taking the financial plunge myself! I strongly recommend your researches include a look at some sailing canoes at an OCSG national meet. There are two in October and the details are on the OCSG website, http://www.ocsg.org.uk/ . Best to take a direct look at what works for sailing upwind, downwind, paddle-sailing, day sailing and multi day sailing expeditions in the Hebrides, and elsewhere, before spending out. You'll also get a lot of candid useful advice from people who've done a lot with sailing canoes over the past 10 or 15 years. There are a lot of ideas for sails, rudders, leeboards and so on which have been tried and found not work well. So best to learn from other people's experiments and mistakes. Many commercially made sails made for canoes have little or no upwind capability. If you've decided you want to adapt your Grunman for sail, a closer look at a variety of sailing canoes is likely to save you a lot of cash and time. If you can make it, the single best opportunity you'll get this year to see / try / discuss assorted sailing rigs will be the last meet of season for the Open Canoe Sailing Group - 26 - 28 October (organiser, Dave Stubbs: DaveS here on SoTP). The turn out is usually good, and the range of rigs being used is likely to stretch from expedition rigs through balanced lugs to bermudans.